Hell-bent for Heaven in Tateyama Mandara treats the history, religious practice, and visual culture that developed around the mountain Tateyama in Toyama prefecture. 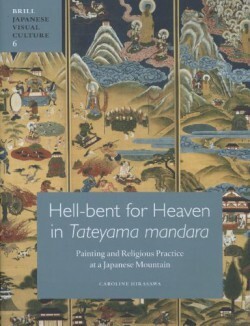 Caroline Hirasawa traces the formation of institutions to worship kami and Buddhist divinities in the area, examines how two towns in the foothills fiercely fought over religious rights, and demonstrates how this contributed to the creation of paintings called Tateyama Mandara. The images depict pilgrims, monks, animals, and supernatural beings occupying the mountain’s landscape, thought to contain both hell and paradise. Sermons employing these paintings taught that people were doomed to hell in the alpine landscape without cult intervention—and promoted rites of salvation. Women were particular targets of cult campaigns. Hirasawa concludes with an analysis of spatial practices at the mountain and in the images that reveals what the cult provided to female and male constituents. Drawing on methodologies from historical, art historical, and religious studies, this book untangles the complex premises and mechanisms operating in these pictorializations of the mountain’s mysteries and furthers our understanding of the rich complexity of pre-modern Japanese religion.